GGift certificates can not be exchanged for cash. Purchased Gift Certificates may be redeemed for services or products - and balances can be carried over. Promotional Gift Certificates may be used for services only and balances may not be carried over. A credit card number and $15 Deposit Per Service, Per Person is required to hold appointments. Deposits are Non Refundable and are Not Transferable to any other person or service. For Parties of 3 or more guests, a minimum 15% Gratuity is automatically added to each service ticket. 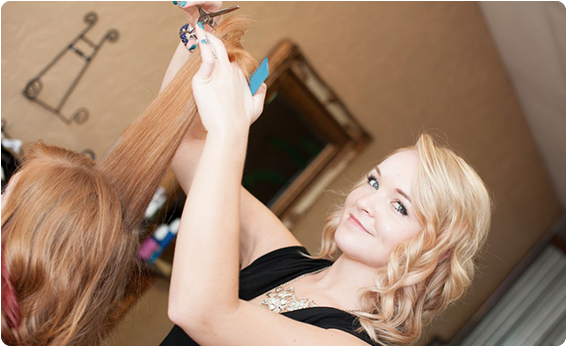 *You are more than welcome to give more than 15% Gratuity if you feel your stylist has done an outstanding job! Please arrive a few minutes prior to your appointment. This will ensure you have the full time for your treatment. As a courtesy, the day before your scheduled appointment, you will receive a confirmation phone call. Deposits, Services, and Gift Certificates DO NOT include Gratuities. It is preferable that Gratuities are paid with cash or personal check written directly to your stylist whenever possible.. Please provide at least 24-hours notice for cancellations. A message can be left after hours, but MUST be left 24 hours before the appointment. Unless it is an unavoidable situation in which it is impossible to give 24-hour notice of a cancellation, or you do not show up for your scheduled appointment, a credit card will be required to reserve all future appointments. IPlease secure all valuables as we cannot be responsible for any lost or stolen property. Please find prior arrangements for children. While we love children, we ask that you bring them in By Appointment Only. If you use your Cell Phone or Device, Please be Courteous to other Guests and Stylists while in Brava Hair Studio and Day Spa. Please keep your Cell Phone or Device on Silent/Vibrate, Absolutely NO calls on Speaker Phone, Do Not Listen to Music or Videos. Please keep your voice down if you must take a call. Please refrain from talking on your cell phone while your stylist is working on your hair and while you have color and/or foils in your hair. It can lead to shifting of the foils, disrupt color/chemicals on the hair, face and neck. Brava/Your Stylist are not responsible for any color imperfections caused by phone/device use. It will also cause your stylist to run behind for their next client due to trying to work around you and your phone. Brava Hair Studio and Day Spa is not responsible for any damage/stains to your phone or device if you choose to use it while having your hair done. No Refunds will be given on Gift Certificates, Deposits, or Pre-Paid Appointments. No refunds will be given on services or gratuities. If you are not satisfied with a product, return the item within seven (7) days and a credit will be issued. No cash refunds. *All makeup and skin care product sales are final. These products can not be returned or exchanged. Brava accepts cash, VISA, MasterCard and Discover (we do not accept American Express or checks). It is preferable, whenever possible, that Gratuities be given in the form of cash or personal check, written to your stylist.